Plato held that the world is divided into two opposed worlds; the sensible or visible world and the real or intelligible world. Plato argues that what we observe in our world (the sensible world) are imitations and copies of the real world. The real world is hence the epitome of perfection and is made of perfect things known as forms or ideas. These include ; goodness, beauty, redness, sweetness and so on, and can be said to be objects of knowledge as they are the cause of all the knowledge we have of all objects since they are the models upon which material objects are based. (For example, an apple is red and sweet because it participates in the form of redness and sweetness.) Forms are the ‘’ideal’’ of every entity. True knowledge can only be obtained if that person perceives the forms and understands the existence of the realms. Plato also classifies forms as unchanging since they are independent of the changes and developments occurring in the sensible world. Forms are basically the real entities which can be accessed through the mind by using reason. Plato uses the sun metaphor to explain the forms in general, and the form of the Good in particular. Just as it is by the light of the sun that things are made visible, so it is by the light of truth that the nature of reality is made apprehensible to the soul. In the world of forms, the mind can achieve rational insight into the truth only by realizing the form of the Good which is the highest form of all.Thus, the Good is beyond being, and the cause of all existence. As the Sun is the source of both light and life in our material world, so is the Good the source of all intellectual light and all spiritual life in the world of Forms. 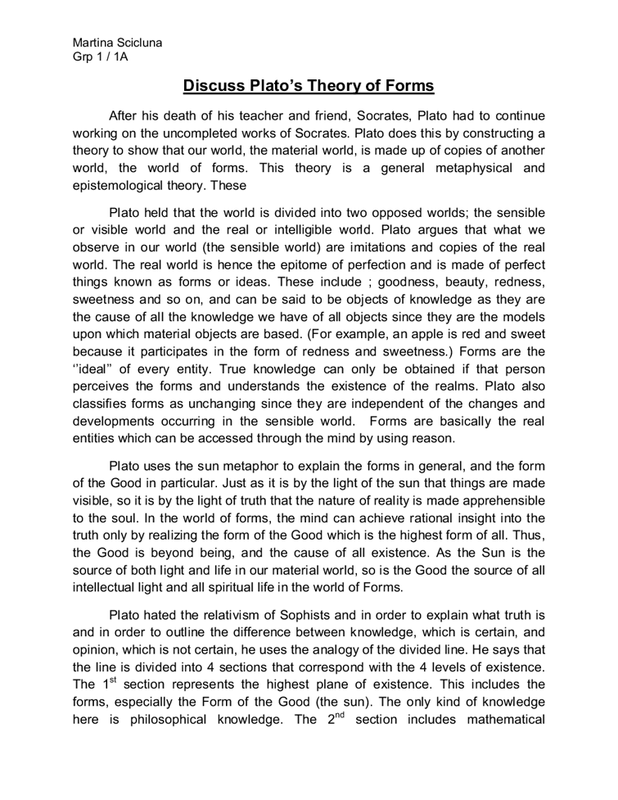 Plato hated the relativism of Sophists and in order to explain what truth is and in order to outline the difference between knowledge, which is certain, and opinion, which is not certain, he uses the analogy of the divided line. He says that the line is divided into 4 sections that correspond with the 4 levels of existence. The 1st section represents the highest plane of existence. This includes the forms, especially the Form of the Good (the sun). The only kind of knowledge here is philosophical knowledge. The 2nd section includes mathematical knowledge (and abstracts, like the numbers). Knowledge here can be verified without the use of observation, and the things here are like forms, but are not forms. They are useful abstracts that build mathematical truths. The 3rd and 4th section take us to the invisible realm. The 3rd section is represented by shadows and other illusions. These are all opinions that cannot be verified philosophically or are false. Things that people believe in that do not exist are here. The beliefs about things and scientific knowledge are found in the 4th section. All physical things are also here. All knowledge here is verifiable through observation, and is rationally supported. The involvement of human beings in the two realms is further explained by ‘The Allegory of the Cave’. In the allegory we find prisoners chained in a cave, unable to turn their heads. Behind them burns a fire and between the fire and the prisoners there is a raised pathway, along which men holding puppets walk. The puppets cast shadows on the wall of the cave that lies in front of the prisoners. The prisoners are unable to see these puppets that pass behind them. What the prisoners see and hear are shadows cast by objects that they do not see. One of these prisoners, though, manages to free himself and escape, to realize the truth that lies outside the cave. A truth which stands in stark contrast to what he was accustomed to back in the cave. When this prisoner goes outside the cave, he looks up at the sun, and understands that the sun is the cause of everything that he sees around him. He then shares what he discovers with the rest of the prisoners only to be made fun of and rendered to be a fool. The puppets represent the forms and this is why they are described as ‘’unseen’’ whilst the shadows are the copies of the forms, as found in the sensible world (represented by the cave itself). The chained prisoners represent the unknowledgeable people (most people in our society) who know nothing about the forms and never give this theory some thought. The environment of the cave and the darkness found in it symbolizes the sensible world. The escape from the cave therefore represents the transition from the sensible world to the intelligible world. The prisoner which discovers this realm exemplifies the philosopher which uses his mind’s ability to conceive the forms in the real world. Plato introduces this theory to find a definition of universal truths. 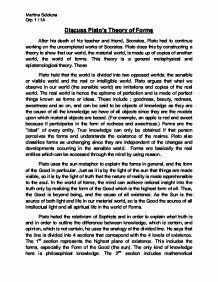 By developing the theory of forms, Plato is also showing the importance of philosophy. This is because the forms can only be known of by reasoning and rationalizing them and this can only be obtained through philosophy. seen; the infinite points which make up its circumference do not take up any space, they just exist in logic rather than in a physical form. Even if someone tries to draw it with the most sophisticated computerised equipment, it becomes imperfect. explain his ideas and philosophy Plato on the body and soul Plato's 3 main ideas on the body and soul: 1. DUALISM - the theory that the body and mind exist separate from each other but linked in some way 2. These go beyond the tangible world. Socrates here says that Eros ( the god of love( was not a real god because he was made from abundance & poverty. Socrates concluded that if one of Eros's parents was poor he could not be a god, as gods lacked nothing. Mill would argue that this is in a sense brainwashing the individuals to believe that they are happy and that they are fulfilling desires, when in fact they are only fulfilling what the Philosopher Kings have told them they desire. He suggests progressions from both illusion to pure thought, and from the less real (images and shadows) to the truly real (the Forms). He also makes two clear distinctions between the world of knowledge and opinion (in the mind), and the world of appearances and the intelligible world (in reality).